November 24, 2018 8:27 pm. 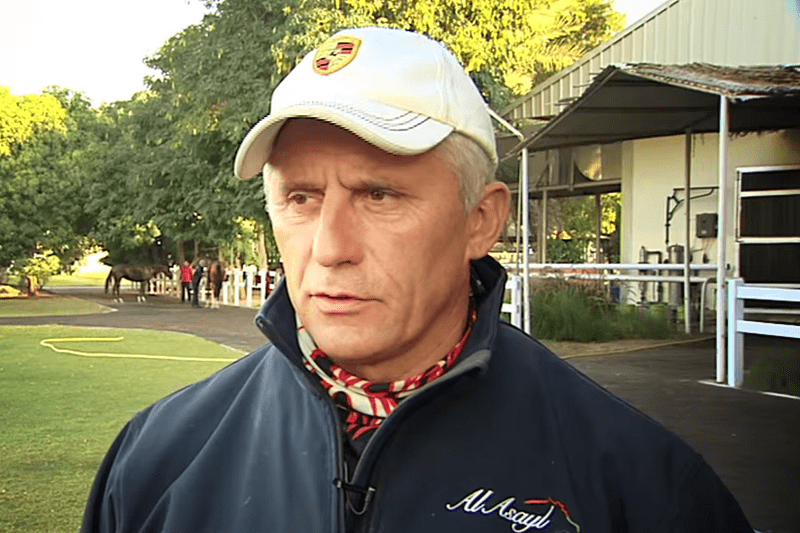 Al Asayl trainer Eric Lemartinel has had another successful meet at Al Ain. Racing at Al Ain on Friday, a seven-race card, was another productive meeting for the Al Asayl team of His Highness Sheikh Khalifa bin Zayed Al Nahyan and trainer Eric Lemartinel who, after a treble at the course’s first meeting of the season last Thursday, combined to win two of the four contests in which they were represented this week. They kicked off their brace in what was a third 1600m Purebred Arabian maiden on the card, one which produced a landmark outcome for jockey Pat Cosgrave who, riding Marahib for Sheikh Khalifa and Lemartinel, registered his 100th winner in the UAE. It perhaps seemed unlikely at halfway when Cosgrave appeared to be sending out distress signals in about eighth of the dozen runners, but halfway up the straight, they suddenly loomed large to deny Tadhg O’Shea a double aboard AF Ajwad. Having her ninth start and seventh dirt outing, the 5-year-old mare Marahib was well beaten on her only previous attempt at 1600m, here at Al Ain, but in handicap company at the beginning of December last year. Owner and trainer promptly completed their double but Cosgrave had to settle for third on RB Burning Ash who, in a three way battle, chased home AF Al Baher, another second for O’Shea, and the gallant Faheeda who dug deep to repel the challenges of both second and third throughout the long straight. For jockey Olivier Doleuze it was a fourth winner from just 11 rides this season and second at Al Ain having won on Joori last week for the same connections. A 4-year-old filly, Faheeda was doubling her career tally on just her seventh outing having won a 1600m Al Ain maiden in January. The only Thoroughbred race, also a 1600m maiden, developed into a duel throughout the long straight between Solar Shower, who led most of the way and Gervais who gained the initiative under Fernando Jara with about 250m remaining. William Lee conjured a renewed effort from Solar Shower but Jara’s mount ran on grimly to open his account at the 15th attempt and eighth in the UAE. Trained by Ali Rashid Al Rayhi, for Jumaa Mubarak Al Junaibi, it was a welcome change of luck for Gervais who, on his previous outing, and seasonal debut at Meydan, unseated the unfortunate Ronan Whelan, who has been out of action since, on the first day of November. When Fahadd and Richard Mullen, sporting the green and yellow checks of Sheikh Mansour bin Zayed Al Nahyan, hit the front 600m out in the 1400m handicap, sweeping past AF Al Mehleb, they looked set to record an easy victory. However, nobody had told the latter, dwarfed by Mullen’s mount but who refused to be intimidated and kept battling for Fernando Jara, probably regaining the initiative 100m from the line, only to be denied in the final strides in a thrilling finish. Saddled by Ahmed Al Mehairibi, celebrating his first winner of the season, the 6-year-old Fahadd was winning for a fourth time and doubling his account on dirt in the process. The meeting concluded with a 1000m handicap and it was the turn of Irfan Ellahi to saddle his first winner of the season, JAP Yajoud, who led close home under Royston Ffrench to deny the Al Asayl team a treble and Cosgrave a double. The opening 1600m maiden, restricted to horses campaigned by private owners, proved a pretty straightforward victory for AF Mo’Assess who was sent straight to the front by O’Shea and was never headed, chased throughout by Reeh Al Janoob who finished runner-up. Making his seasonal debut, the 5-year-old gelding was having his tenth career start and was another winner for owner Khalid Khalifa Al Nabooda and Ernst Oertel who trains the majority of his string. The lead changed at least four times throughout the home straight in a second 1600m maiden in which O’Shea again attempted to make all, this time aboard AF Fakhama but passed about 500m out by Rasi Al Khalediah II under William Lee. They were immediately challenged by Taqa who took over at the head of affairs passing the 300m pole only to be passed by AF Al Wojood shortly after. It was the latter, under Elione Chaves, who would gain the spoils but only after a brave effort from Taqa who may well have led again, briefly, close home.